As molecular diagnostics for oncology shifts into clinical practice, efforts have not only focused on genotyping patient-specific tumors to initiate targeted therapies, but on early detection, availability, improved quality control, and refined workflow. One major push, that exemplifies the concomitance of these trends, has been the rise of the less-invasive and more cost-effective liquid sampling for cancer diagnosis; sometimes called a liquid biopsy. Like most people who have studied cancer, Mark Li, CEO of Resolution Bioscience, a Seattle-based genetic diagnostics company, was struck by how devious the disease was on a scientific level. “You apply pressure in one place,” he says, “and it pops out somewhere else with something completely different.” For example, targeted therapies, such as the ALK gene inhibitor Crizotinib from Pfizer, would work for a while but eventually everyone would relapse. The Resolution Bioscience ctDx™ platform can detect single nucleotide variants (SNVs), insertions and deletions (indels), copy number variations (CNVs), and fusions from a single blood sample. Guanine-cytosine bias correction chemistry allows for even depth regardless of sequence composition. The technology can discover novel gene fusions without prior knowledge of the breakpoint or fusion partner. Traditional tissue biopsies, while useful in initial cancer diagnosis, were not providing the type of real-time monitoring necessary for effectively catching relapse and shifts in the cancer’s gene signature. Alternatives to traditional tissue biopsies are being explored by Resolution, which was founded by Chris Raymond and Lee P. Lim to create a minimal viable product in the bioinformatics space. Such a product, the founders reasoned, could change the timeline for cancer therapies. At present, the company is developing a molecular diagnostics platform it calls ctDX. This platform focuses on cell-free DNA that is obtained from cancer patients. Shed into the bloodstream by dead and recycled cells, cell-free DNA consists of DNA segments that have lengths of 165–330 base pairs. Resolution intends to develop several assays using the ctDX platform. For example, the company recently introduced an ALK assay for the predominant ALK/EML4 gene fusion as well as others that cover the commonly found ALK >kinase mutations. This assay relies on capture probes that are fairly small, just 40 base pairs. They are designed to be adjacent to the genetic region of interest, a configuration that avoids region-spanning configurations that could result in the isolation of off-target segments. One of the big advantages of using patient blood, notes Li, is the quick turnaround time. A blood-based approach could take just three to four days, where as a tissue biopsy could take three to six weeks. “That stage of relapse is one where blood is really going to shine,” insists Li, who adds that a tumor may be initially driven by an ALK fusion but also contain a p53 suppressor mutant. “Sometimes you can hammer down that initial driver, but it escapes with a kinase domain point mutant,” which can be tracked by following the still present p53 biomarker. Without quick results, clinicians often resort to placing patients on less effective broad-spectrum therapies. But what if clinicians could avail themselves of speedy blood-based results? In addition to changes in the actual tumor, there are, many have noted, changes in the body as a result of the tumor. Molecular research, for example, has shown that Collagen 10 alpha 1 is high in both development and cancer. Using in-licensed technology developed at the Wistar Institute, OncoCyte refined a messenger RNA–based noninvasive blood test that would separate suspicious results from benign ones, allowing a large set of patients to “avoid invasive and expensive downstream procedures.” The company intends to run the cancer test in-house using the NanoString Technology nCounter™ machine, which, according to Dr. Chapman, is more sensitive and reproducible than the Illumina platforms, where the biomarkers were discovered, especially in the detection of low-expression genes. “NanoString is basically a one-to-one hybridization reaction and a digital counting methodology that eliminates amplification,” informs Dr. Chapman. Using similar technology, OncoCyte is developing a diagnostic that can be used for the noninvasive detection of bladder cancer in urine samples. Such a test would benefit two different patient groups: patients presenting with hematuria, a common symptom of bladder cancer, and patients with a history of bladder cancer undergoing recurrence surveillance. In addition to making tests more “user friendly,” Q2 Solutions, a joint venture recently launched by Quintiles and Quest Diagnostics, hopes to provide state-of-the-art clinical trial laboratory services. Q2 (pronounced “Q squared”) is also interested in bringing to market diagnostic products that deliver enhanced predictive value. “We offer a wide spectrum of genomic tests and molecular assays in laboratory facilities around the world,” says Victor Weigman, Ph.D., associate director of translational genomics at Q2 Solutions. Commercially available tests—such as digital droplet polymerase chain reaction (PCR), quantitative PCR (qPCR), NGS, and laboratory-developed tests—will be important in developing future clinical trials for precision cancer diagnostics. “This has led to many multiyear projects with pharma that have resulted in laboratory-developed tests that can be used to stratify patients into various clinical trials,” he explains. Patients and institutions will also benefit from reduced error rates in genotyping calls. According to Karin Schmitt, Ph.D., reagent products director at Horizon Discovery, up to 30% of genotyping calls are called incorrectly. Working with standardized testing bodies such as the CAP (College of American Pathologists) in the United States and the EMQN (European Molecular Genetic Quality Network) as well as client labs, Horizon hopes to reduce the incorrect call rate by using their reference standards. These standards also allow the facility to establish assay specificity as well as limits of detection. “We use either adenoviral or CRISPR-based engineering to take a parental cell line and introduce a specific nucleotide change,” says Dr. Schmitt, who has been involved in Horizon’s R&D efforts since starting with the company four years ago. “There are other companies that are adding plasmids to cell lines,” she adds, as well as selling genotyped tissue material, but no one else is working on specifically engineered cell lines. Horizon Discovery is working to improve genotyping call rates among client laboratories and bodies responsible for conducting standard tests. The company asserts that its HDx DNA Reference Standards are specifically designed for the validation of genotyping assays and for comparing different platforms. 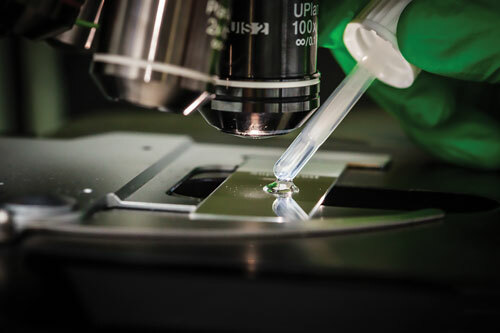 In this image, a HDx reference standard is being stained on a slide before review under a microscope. Horizon’s cell lines are produced on a common genetic background. This approach allows only the engineered change to stand out during sequencing. In addition, the cell lines are manufactured in a highly reproducible manner from batch to batch. According to Dr. Schmitt, Horizon sells its reference standards independently in order to support the molecular diagnostics market’s current emphasis on laboratory-developed tests. In addition, Horizon works with “major players in the molecular diagnostics space to provide standards that they would like to incorporate in their future submissions to the FDA.” In this way, Horizon hopes to play a role in refining call prediction in molecular diagnostics as the field standardizes. The future of liquid sampling for molecular oncology is already here, suggests Michael Watts, vice president of investor relations and corporate communications at Hologic. Watts used to work with Gen-Probe, which produced the first FDA-approved nucleic acid test (NAT). This test, for Legionella, began shipping in 1985. “Back in 2003,” recalls Watts, “Gen-Probe introduced a system called Tigris. Tigris was the first fully automated super-high-throughput testing device for molecular diagnostics.” Gen-Probe was acquired by Hologic in 2012, and the Tigris is still used in blood banking to screen for HIV, hepatitis C, hepatitis B, and West Nile virus in donor blood. In 2012, Hologic introduced the fully automated Panther System, a smaller and more accessible system that expands upon the earlier Tigris engineering. “Panther is really the platform on which the Hologic molecular diagnostics business is built today,” explains Watts. Although the Tigris and Panther are closed systems, they contain a suite of technologies, such as ribosomal RNA detection, target capture for purification, and transcription-mediated amplification (TMA). (TMA, which was developed by Gen-Probe, is a means of amplifying target rRNA.) The systems are capable of handling liquid samples such as whole blood, urine, and liquid PAP samples, as well as urethral and vaginal swabs. The Panther System is being developed to accommodate an extension, the Panther Fusion module. When it incorporates the module, the system will gain the capacity to perform PCR and qualitative detection, a means of detecting amplicons. 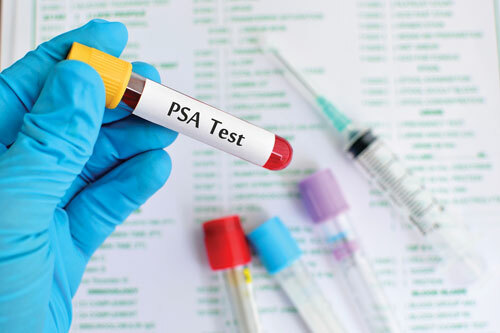 Hologic’s prostate cancer test, which was recently approved by the FDA, improves upon the less sensitive and less specific standard PSA tests via examination of the PCA3 gene in urine. It is also being developed for the fully automated Panther System, exemplifying the trend toward automated molecular diagnostics testing in oncology and other diseases.